Prestigious art festivals, concerts, opera season, period pageants, local food festivals, wine festivals: Umbria celebrates its history and culture with artistic and folkloristic events throughout the year, attracting visitors from all over the world. In addition to the following major events, there are some smaller ones that constantly recur and are part of daily life in the historic center of the city: concerts or conferences, the antique Market that takes place along the streets of Spoleto every second Sunday of each month, the so called " zero kilometers market" a small farmers' market in the main square where each mornings, a few farmers sell their traditional products. Continue until the Epiphany (January 6) the celebration of the Christmas nativity , events and concerts of sacred music in old churches of Spoleto and major cities in Umbria, such as Assisi. historical parade through the streets of the city to celebrate the patron saint. 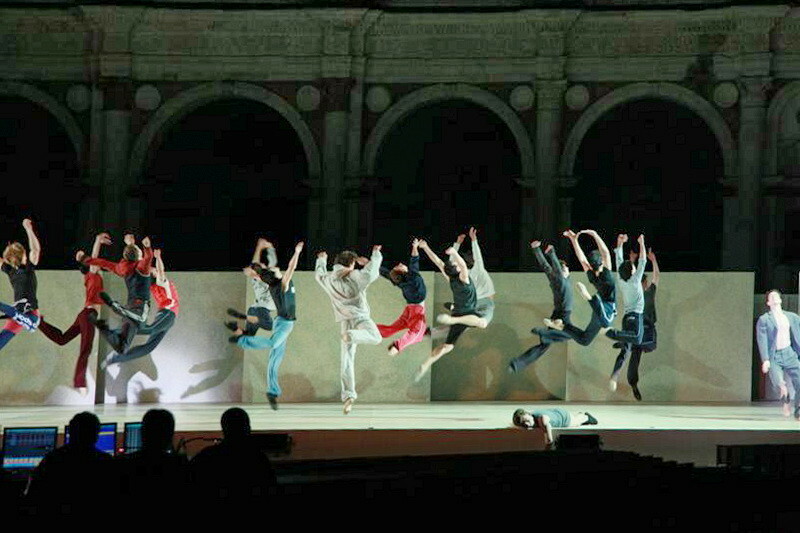 Spoleto season continues with performances at the Teatro Nuovo and the Teatro Caio Melisso. Spectacular event with concerts from noon to night. Parade in the streets, historical and charming party in mask in the magnificent setting of Palazzo Leti Sansi. Within the walls of Norcia, the baautiful city in the Natural Park of Monti Sibillini, an event that celebrates truffles, meats, cheeses, the famous Castelluccio lentils and berries. San Benedict is the city's patron and patron of Europe. On the evening of 20 March arrives in Norcia, accepted by the ambassadors of European states, a torch from a European capital. The day after in Norcia there is a medieval parade and historical competitions between districts. 13 km from Spoleto, in this small village of Valnerina, takes palce an exhibition dedicated to black truffle and specialties of the area. The city celebrates the rites of Easter with processions and sacred representations, enriched by the taste of traditional recipes. Prestigious international event, now in its eighteenth edition. A short walk from the apartment, in a period palace there is the important event, a week of conferences on the High Middle Ages. A repertoire that goes from classical to jazz, from minimalism to film music, played by established stars and young talents. Art, breakfast and music among the olive trees. 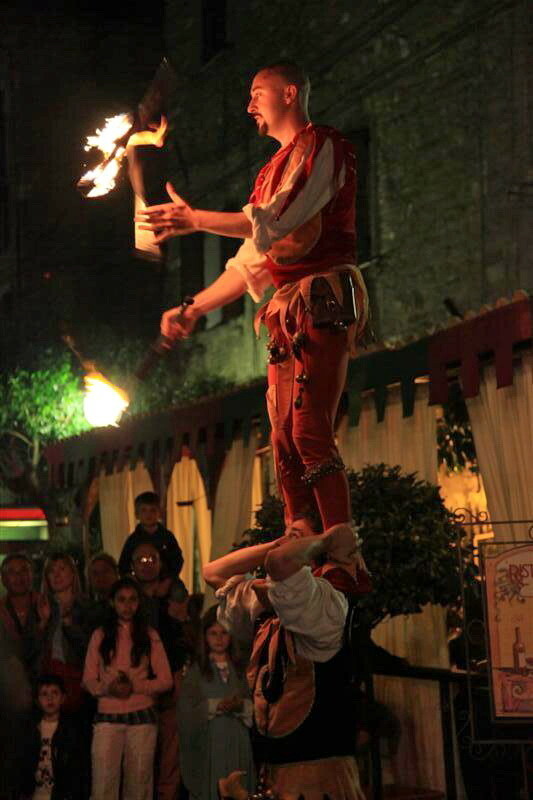 The ancient festival is about the story of Narni, a beautiful Roman village near Spoleto, recalling municipal statutes codified in 1371, the Knights of Narni have to demonstrate their ability to defend the city. Selected galleries, rare and precious atmosphere of the times: central event for all lovers of ancient art. Two weeks to promote the territory of Lake Trasimeno with the Festival of Kites. 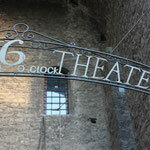 Theatrical performances, exhibitions, folk performances, and dialect songs in the night until the following morning. 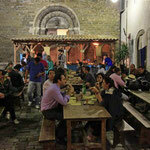 Just 5 km from Spoleto, a festival in a charming village, with taverns for tasting the wild asparagus. 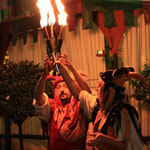 Events and dinners in the main wineries of Umbria. 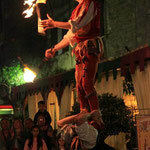 One of the most important folkloric event in Umbria, the big "Running Ceri" are even the symbol or Umbria. Festa dei Ceri has ancient pagan origins, with a Christian version. Do not miss this incredible pageant! The Calendimaggio or "sing in May" is a festival season, of pagan origin, which celebrates the return of Spring. During 3 days the city is transformed to relive the atmosphere of the past with parades, competitions and demonstrations in period dresses. Theatrical performances, exhibitions, folk performances, and dialect songs in the night of 30 April and early May until the morning. Spectacular event in the medieval center of Spello, the streets are colored with amazing works of art created on the ground with flower petals. The floral carpet is prepared during the night, to give hospitality, in the morning, to the procession of Corpus Domini. In this wonderful village from Valnerina, considered one "of the most beautiful villages in Italy", the feast takes place and celebrates the cheeses and the products of local sheep-farming. Antique carousel in which the rider must hit a ring running with his horse at full gallop, an event of great impact and participation. Monti Sibillini National Park is celebrating the blooming of colorful Pian Grande, at the foot of Mount Vettore. An unforgettable event for nature and photography lovers. 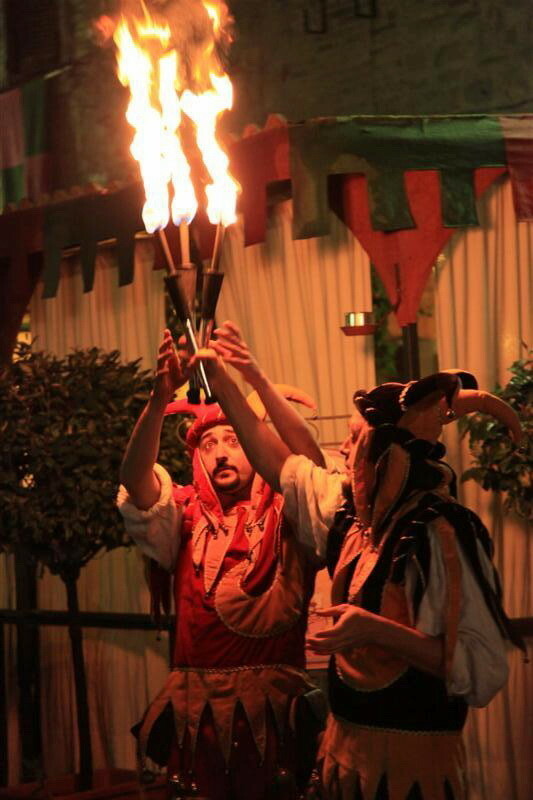 Unmissable event in the ancient and beautiful city of Bevagna, for a week the city is immersed in the Middle Ages, visitors can admire the fascinating reconstructions of ancient crafts, such as the tanner, the glazier, the painter, the coiner of money, the binder manuscripts, the miniaturist...Taverns invite you to try wines and ancient recipes. 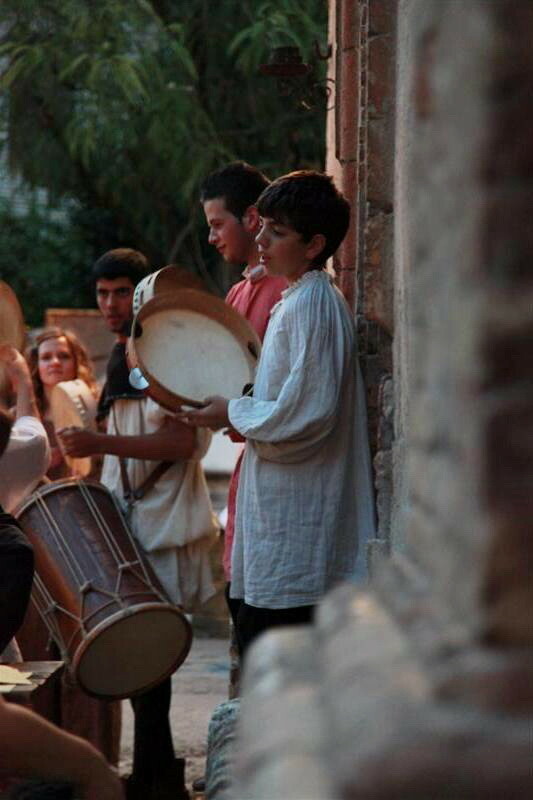 Music and Wine on the trails of Umbria. The main international event in Umbria and one of the most important in Italy. Founded in 1958 by Maestro Giancarlo Menotti, is one of the most important manifestations of art and culture. Streets, lanes, squares, churches and theaters of the historical centre of Spoleto, give hospitality to some of the most illustrious artists of the world. Concerts, theatrical performances, exhibitions and performances of classical and contemporary ballet at a very high level. A unique event of great impact in the media that has a great seccess and its counterpart in the U.S. city of Charleston, twinned with Spoleto. 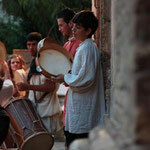 Music, dance, theatre, poetry of the Middle Ages. Shows, cabaret, concerts of international artists. 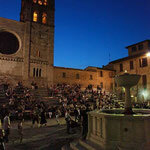 A series of events animates the city for very pleasant summer evenings in Spoleto. Event that celebrates the pairing between films and culinary delights in the beautiful "Literary Coffe shop" of the Ancient Library of Spoleto. 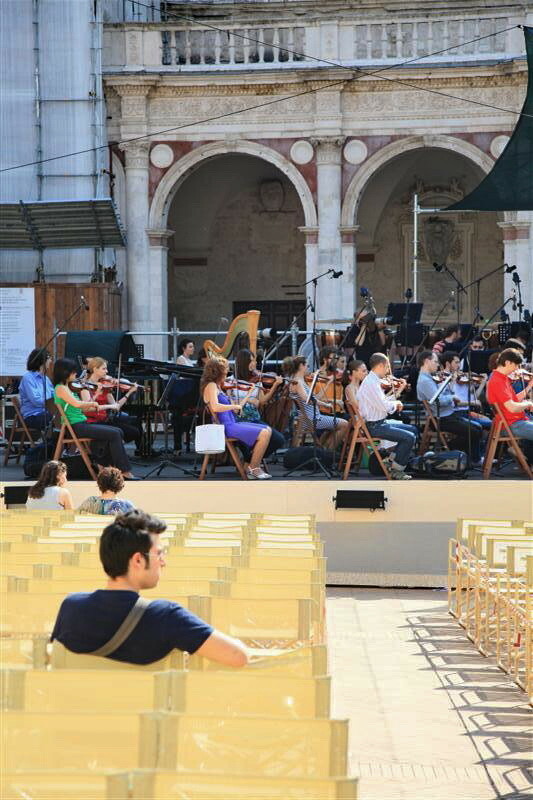 Great concerts in Spoleto and others cities of Umbria. The most important Italian jazz event. During the first two weeks of July, the wonderful city of Perugia hosts spectacular concerts and very popular jazz artists. a few kilometers from Spoleto, in the beautiful village of Spello, a festival dedicated to the famous wine called Grechetto. Great artists and musicians celebrate the life and works of Saint Francis. Amazing spectacle of balloons, a chance to visit the charming medieval town of Todi. competition of historical boats in the beautiful Lake Trasimeno, a chance to spend a day visiting the islands of Lake Trasimeno. The Opera Theatre ( called "Teatro Lirico Sperimantale") founded in 1947 presents its opera season. "Vaite" means the districts of the city during the fourteenth century. Period pageant in the historical centre: archers, knights and flag-wavers. Un opportunity to immerse themselves in an atmosphere of times gone. Beautiful village a few km from Spoleto, for its views is called "balcony of Umbria". The event celebrates the famous wine called "Sagrantino". An event to discover the Umbrian landscape, hills, mountains and typica products of Umbrian tradition. Festival celebrating the famous potato coming from the hills.
" Donation of the Holy Thorn - Montone - Second-last Sunday in August"
Suggestive pageant with period dresses, to commemorate the historical event of the donation of one of the thorns in the crown of Christ. Festival of Blues music in the charming town of Narni. Traveling international exhibition dedicated to music. The city of Todi is the scene of this festival that celebrates the arts, a great chance to visit the city and its beautiful roman and medieval monuments. Famous horse race, an unmissable event for lovers of horses and a chance for visiting Assisi and its wonderful churches with paintings of Giotto and Cimabue. Characteristic annual event with a large trade fair along the streets of Spoleto. An event that compares producers, consumers and national and European authorities on the culinary excellences. The period palaces of Spoleto give hospitality to experts in the food sector and exposure products with short stages for tasting. week dedicated to know and tasting the famous wine called "Rosso di Montefalco". The event takes place in Montefalco, beautiful city a few km from Spoleto, for his landscapes called "balcony of Umbria". Exhibition of contemporary bands and historical groups. Amusing concerts with cover of '60s beat period. The greatest DJs of Italy meet in the cloister of the ex-Convent of St. Nicholas to exhibit in high-level performances. Historical event with period dresses, among the city streets with a hourses race ( "giostra"). Event that has enjoyed a great success, 20 minuts from Spoleto, the festival that celebrates Pasta, which has made known Italy in the world. Stages in kitchen, tastings with chefs who prepare their best dishes. Great events for celebrating the International Day of peace in the world. A chance to visit the famous city of Assisi, just 30 minutes from Spoleto. 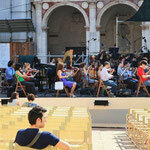 Series of concerts in some of the most beautiful old towns near Spoleto. 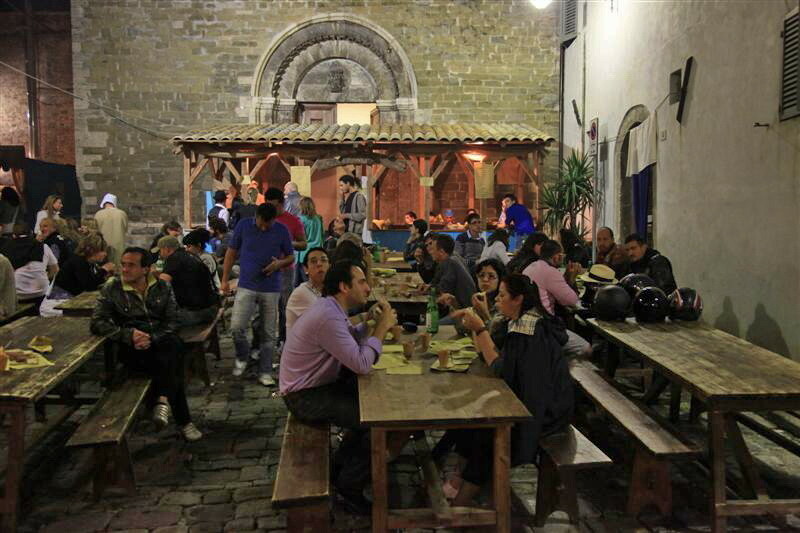 Amazing event, in the animated pubs of the town you can eat the famous onion of Cannara, cooked in thousand ways. An interesting opportunity to visit Orvieto, a beautiful Umbrian city, known for its wonderful Cathedral. Organized by "Slow Food" and "Cityslow", Orvieto con Gusto promotes the quality of wines and foods to improve the quality of life of people, and defend the environment. Festival of "Black celery and Sausage" - Trevi - third Sunday of October. Euro Chocolate Festival - Perugia - third week of Octobe. The famous festival's theme is the world of chocolate, a sweet way to visit the beautiful etruscan city of Perugia. Celebrations in honor of St. Francis - Assisi - early Octobe. 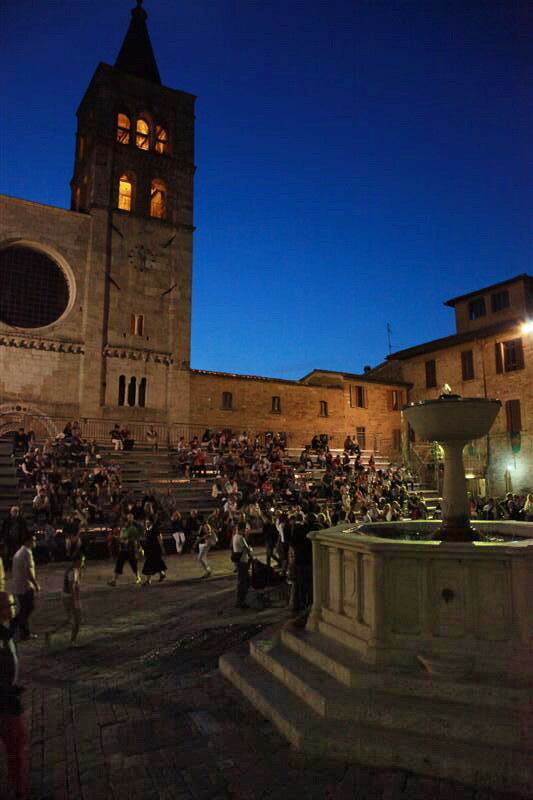 Assisi, a half hour drive from Spoleto, celebrates its saint, known throughout the world. Tourists can visit the magnificent basilica with frescoes by Giotto and Cimabue. Fair of pure saffron of Cascia - Cascia - end of October, early November. The saffron comes from the mountains around in the city that gave birth to S. Rita. Back Beat - Spoleto - Late September, early Octobe. Exhibition of contemporary bands and historical groups. Amusing concerts with cover of '60s beat period. "Orvieto con Gusto" - Orvieto - Late September, early October. Organized by "Slow Food" and "Cityslow", Orvieto con Gusto promotes the quality of wines and foods to improve the quality of life of people, and defend the environment. Tasting the extra virgin olive oil at the event "Frantoi Aperti"- Umbrian cities and villages, including Spoleto - 8 weekends from November to half December, interesting and well done event to learn about and taste the extra virgin olive oil, directly in the many places of production. 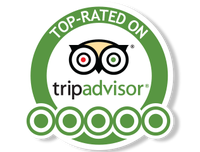 Free tastings, concerts, exhibitions. Festival of pure saffron of Cascia - Cascia - end of October, early November. The saffron comes from the mountains around in the city that gave birth to S. Rita. Oil Festival "Festivol" - Trevi - first weekend of November. Local festival about "New oil", the event takes place in the charming ancient village of Trevi, near Spoleto, and lets you know the techniques of producing oil, to buy and taste the famous extra virgin olive oil from Umbria. Forest Festival "Festa del Bosco" - Montone - first weekend of Novembe In one of the most beautiful towns of Umbria, let's discover and buy the products and fruits of the forest. Tasting the extra virgin olive oil "Frantoi Aperti"- Umbrian cities and villages, including Spoleto - 8 weekends from November to half December, interesting and well done event to learn about and taste the extra virgin olive oil, directly in the many places of production. Free tastings, concerts, exhibitions. Oil Festival " L'Oro di Spello" - Spello - late November, early December. November is the month for picking up olives and producing the fine and tasting extra virgin olive oil. The beautiful town of Spello, surrounded by hills of olive trees, celebrates its "golden" handmade product. Soul Christmas - Passignano sul Trasimeno - from the second week of December to the first of January. Concerts of famous Afro-American singers, near lake Trasimeno. 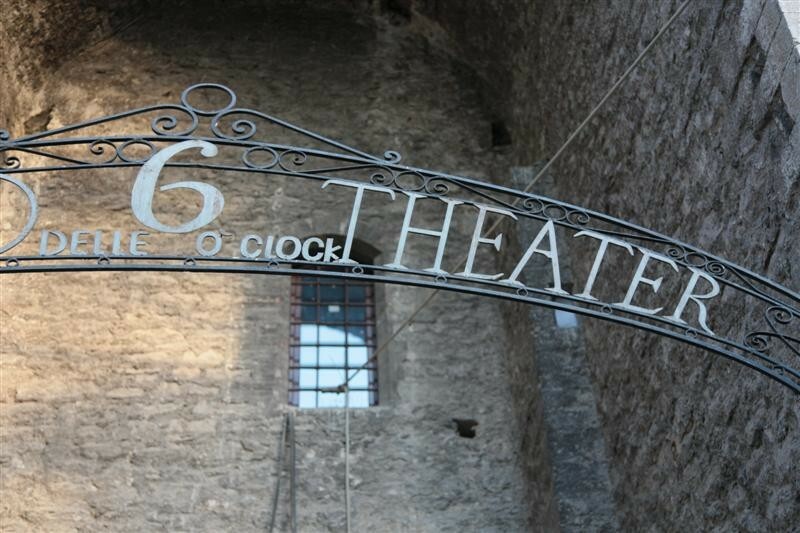 Events for the End of the Year - Spoleto - from half December to mid January: A rich calendar of events to greet the old year, the celebrations animate the city center for the entire Christmas period: Christmas Market in the historical centre, Artistic exhibitions in museums, concerts in the theatres, Holy concerts in many beautiful churches and the main theatres of the city, New Year's Day with great concerts and music all over the night in the main squares and streets of Spoleto.